Plumbing and cars! Cars and plumbing! Hard to see the connection, isn’t it? At first glance how can there be a connection between the two, but to Charlie Vinci there certainly is. At the tender age of 14 Charlie was eager to get into the big world and the idea of being an apprentice automotive electrician appealed. However Charlie struck a snag, as automotive electrical cables are colour coded and he soon found a problem with his colour vision. What was unfortunate for a young Charlie Vinci was destined to be of great benefit for the future classic car owners of Perth. Undaunted Charlie turned his hand to electroplating and started a five year apprenticeship. For the next ten years Charlie worked for Quality Plating in Perth and says that his boss had him working on every facet of the business. Charlie did everything from polishing to plating and was in charge while the boss was away. At the time the majority of the plating work was for plumbing fittings. Charlie Vinci found himself well known within the plumbing industry and was approached by a regular customer who offered to set him up in business. That was in 1985, and as Charlie had often longed to work for himself, he grabbed the opportunity with both hands. Soon Vinci Chrome was formed and he hasn’t looked back. At first Vinci Chrome strictly specialised in plating plumbing fittings, but in the electroplating industry like so many others Charlie found his livelihood threatened by cheap imports. Undaunted Charlie heard of another electroplating business that was going under and bought their semi-automatic equipment. While that decision was important enough, his next was of momentous importance. 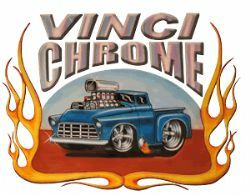 Charlie decided that Vinci Chrome was to diversify into the automotive industry and in particular the aftermarket repair, classic and performance areas. The lack of copper plating equipment certainly didn’t deter Charlie as that was soon added to the company’s inventory. Charlie explained to Classic Car Gurus that copper plating is vital as it prevents the underlying steel components from corroding. Apart from any repairs and polishing, chrome plating over steel consists of three separate plating processes: Copper, nickel and finally chrome. It wasn’t long before Vinci Chrome was no longer a one man show. So much so that Charlie now employs eleven staff including his son Michael. There are five metal polishers, one person strips the components back to bare metal, two others chrome plate, another prepares the components by wiring them and depending on whether it’s really busy or not there may be another two working hard at removing the components from the wire and giving a final clean. There is also another person holding the front office together. If you’re wondering where Charlie is while all this is going on, he is at the counter making sure the customer receives exactly what’s needed. Vinci Chrome also repairs what they plate. If you have a bumper that has seen better days, bring it along and Charlie will make sure it’s hand formed back into its correct shape before plating. Charlie is also proficient at repairing die cast components, but as we know these can be difficult especially when it comes to filling those telltale pockmarks, so he is loathed to provide the same level of guarantee. No doubt we have all had various bits and pieces chromed, so we were interested in just what’s involved. Providing no repair is required, the part is first stripped back to bare metal in a phosphoric acid bath that also removes any rust. It is then lightly sanded to a 240 grit finish before sitting in the copper solution for 90 minutes. After copper plating it’s thoroughly washed and then polished with a mop. As you could imagine constant cleaning is vital and at this stage the part is cleaned in a caustic bath before being electrically cleaned and rinsed. Next comes a light acid dip, then another rinsing and into the nickel bath for 45 to 60 minutes. Once again it’s rinsed before it goes into the chrome bath for just three minutes. Out of the chrome bath and yes it’s time again for a thorough cleaning before being wrapped up ready for the customer. Charlie likens the final plating to a coating in hard lacquer that happens to be chrome. Charlie assured us that for chrome plating it doesn’t matter if it’s big or small as the main tanks are 2 metres long, 400 mm wide and 900 mm long. Big enough to take the largest of bumpers. There are more things to Vinci Chrome than it seems, as Charlie also provides a barrel nickel plating service for fasteners and other small pieces where a chrome finish is not required. Vinci Chrome will also silver and gold plate if needed. And yes Charlie is still happy to take on the plating of your plumbing fittings. 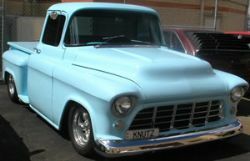 Enthusiastically Charlie Vinci says that he, his company and employees are passionate about helping the customer achieve the result they are looking for with their American, European and English classic car and hot rods. All you have to do is to call and discuss your needs.